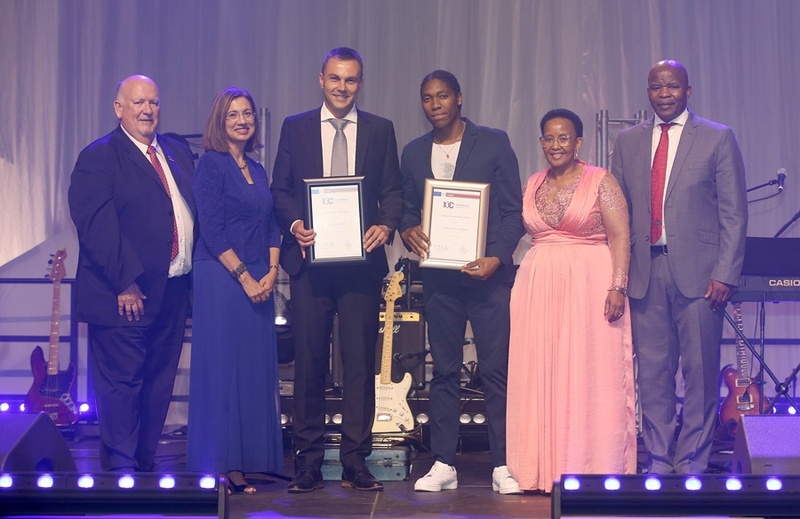 The University of Pretoria honoured Olympic gold medallist Caster Semenya and hurdles champion LJ van Zyl as Athletes of the Century at the recent TuksAthletics Centenary gala dinner, which celebrated 100 years of UP sporting excellence. Hardly a year has gone by since 1918 without at least one Tuks athlete pushing the boundaries to set new challenges – and the judges decided Semenya and Van Zyl represent the pinnacle of sporting achievement over TuksAthletics’ first century. Semenya’s success story started when she joined TuksAthletics in 2009 as a shy young athlete from Limpopo, and over the past 10 years, she’s defied the many obstacles thrown in her path. Her performance in the 800m speaks for itself: Semenya won Olympic gold in 2012 and 2016, and three gold medals at the World Championships (2009, 2011 and 2017). She went on to win bronze in the 1500m at the 2017 IAAF Championships, and gold for the 800m and 1500m at this year’s Gold Coast Commonwealth Games. And her best 800m time of 1:54.25 places her fourth on the IAAF all-time list. Hurdles champ Van Zyl has been one of South Africa’s most prolific international medal winners since 1992, and what makes his achievements all the more remarkable is that he was diagnosed with polio at three years old. Van Zyl believes that running and hurdling played a significant role in helping him to overcome polio. Tuks Athletes of the Century LJ van Zyl and Caster Semenya (middle) with (from left) TuksSport Director Toby Sutcliffe, UP Vice-Chancellor Professor Cheryl de la Rey, Sport and Recreation Minister Tokozile Xasa, and Athletics SA President Aleck Skhosana. He was a junior 400m hurdles world champion in 2002, won gold at the 2006 Commonwealth Games, silver at the 2010 Commonwealth Games and bronze at the 2011 World Championships. He was also part of the relay team that took home the silver medal in the 4x400m relay at the 2006 Commonwealth Games as well as at the 2011 World Championships. Van Zyl was the first athlete to set a South African record on the Tuks track when on 25 February 2011, he raced to a 47.66s win. But the pinnacle of his hurdling career was undoubtedly in 2011, when in the space of just 95 days, he broke through the 48 seconds barrier on four occasions, clocking the four fastest times of the year. Though he admits that running 47.50s would probably have been the ultimate race for him.